This is my Cheddar Jalapeño Sourdough Bread. And this bread doesn’t come alone. No sir, no ma’am. It comes with a delicious Roasted Garlic Spread too! I’ve been baking Sourdough for quite some time now. You can read a little bit about my Sourdough Saga here. I currently have a mother starter I keep alive, Phoebe. Phoebe came to life a couple months ago. I feed her, sometimes talk to her. I mean, she IS alive! Seriously, there’s a great article by Shed that talks about Starters being living things, you can read it here. I want to make a whole post about how I made my starter and how I care for it. But, for now, my sourdough friends can enjoy this recipe I bring today. 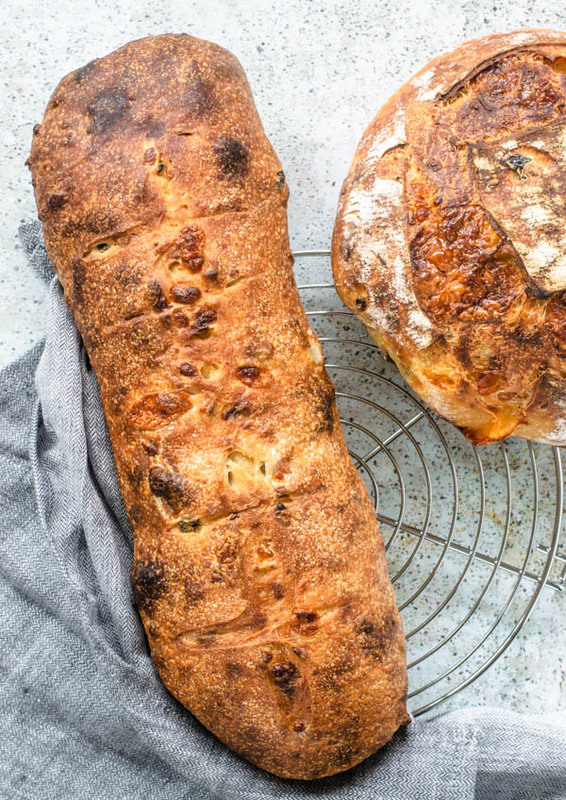 This Cheddar Jalapeño Sourdough Bread recipe really isn’t for a beginner. It takes 2-3 days to make it. And, you must have a mother starter that you cultivate and care for at your house. 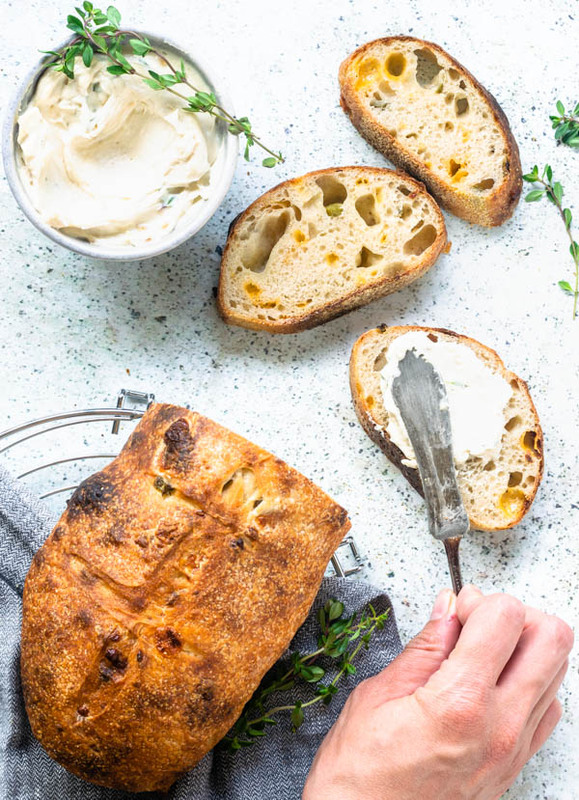 If you can’t make this Cheddar Jalapeño Sourdough Bread, you could give my Roasted Garlic Spread a try, even with some other bread you make, or with some bread from the grocery store. Let’s get talking about the bread!! I want to talk a little bit about Baker’s Percentage. Math was never my favorite subject back when I was in school. I can’t say I was terrible at it, but I sure wasn’t the very best. And the whole Baker’s Percentage thing can be quite confusing. So let’s keep it light and quick and talk about the hydration on this specific Cheddar Jalapeño Sourdough Bread. The hydration of our Cheddar Jalapeño Sourdough is 68%. That’s not extremely high, nor extremely low. It’s in between. To calculate the hydration of a bread, we divide the TOTAL WATER WEIGHT by the TOTAL FLOUR WEIGHT, times 100. So, in this dough, we have to consider I keep my starter at 100% hydration, which means I feed it with equal amounts of water and flour. And I say this, because you have to account all the flour and water in the dough, even the water and flour present on your mother starter. Therefore, we add 2.25 oz (half of the mother starter’s weight, which I mentioned I keep at 100% hydration), plus 2 oz of water in our starter, plus the 14 oz of water in the final dough. This brings us to 18.25 oz of Total Water Weight. To calculate the Total Flour Weight, we add 2.25 oz (the other half of the mother starter’s weight), plus 4.5 oz of bread flour in the starter, plus the 20 oz of bread flour in the final dough. Finally, if we divide the 18.25 oz water by the 26.75 oz of flour and multiply that by 100, we will obtain 68.22%. Badabing! It’s really not that complicated. I used an old sourdough recipe I had, actually the very first recipe I ever used to make sourdough bread years ago. I figured that if I add about 40% of the Total Flour Weight in fillings, I will end up with a nice ratio of filling/bread. That’s why I added about 10 ounces of jalapeño and cheddar combined. If you wanted to make this recipe but wanted to leave the jalapeño out, or add something else like garlic, or whatever, you would just adjust the amounts to account for this 40% of the Total Flour Weight. And, you could really add anything. Leave the jalapeño and cheddar out, and add nuts and other kinds of cheese, if you will! Whatever you think is delicious and would dream about eating in a beautiful loaf of bread. Jeez, guys! I know this whole thing can sound kind of confusing if you don’t bake a whole lot of sourdough. 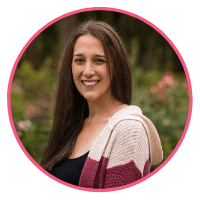 If you have any questions or would like to talk about Baker’s Percentage, I’d be so happy to have that conversation! Just comment here or send me a dm on Instagram @camhurstt, because I am really passionate about this kind of stuff, and I am learning a lot as I go, and what better way to learn than to discuss the topic with our beautiful and lovely engaging community of bakers? Oh, just one more thing I want to say about the fillings! I like to chop my cheese in small pieces instead of shredding it, because this way, it creates these amazing little pockets of melted cheese throughout your bread as it bakes. If you add shredded cheese, I’m sure it will be delicious, but the cheese will be more incorporated in the dough. I like to use a plastic scraper to assist in making my sourdough loaves. I use it to help me transfer my dough from place to place. The scraper just makes it easier. And this is my exact same Dutch Oven I use, not only to make bread, but to make EVERYTHING! It’s one of my favorite kitchen gadgets of all times! 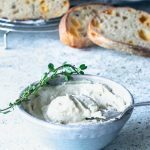 The Roasted Garlic Spread is one of those things that if you bring to a party or whatever, someone will ask you for a recipe for it! And tell them: it’s so EASY too! This is a rich and delicious spread! Very flavorsome! When you roast the garlic, your whole house will smell like garlic heaven! Throw a sprig of thyme or rosemary with your garlic, inside the aluminum foil packet, just to see what happens! You’ll never smell anything like it! You can use roasted garlic in anything. After it’s roasted it will be like a paste. Add it to pasta sauce, breads, sauces, pizza, literally anything. For real, everything is better with roasted garlic in it! And, more importantly, add it to this Cheddar Jalapeño Sourdough Bread! It was the most perfect match! 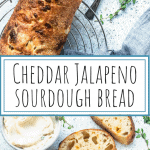 This Cheddar Jalapeño Sourdough Bread recipe makes two delicious loaves or many smaller rolls. 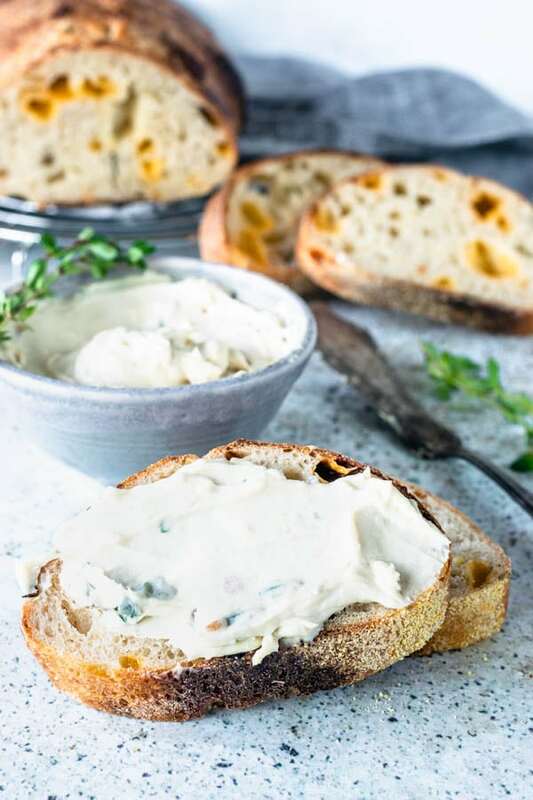 Make sandwiches or eat with the Roasted Garlic Spread! Mix mother starter, bread flour and water in a bowl. Work the dough a bit with your hands or a spatula. Once the ingredients are mixed, keep working the dough with your spatula, or hands, for about 1 minute. Cover bowl with a towel or plastic wrap. Let it rest on your counter for about 4 hours. Remove starter from the fridge one hour before you are going to make your bread dough, so it comes to room temperature. Add flour, salt, and water to the starter. Knead the dough by hand for 5 minutes. Let it rest on top of the counter for about 5 minutes to relax the gluten. Get back to kneading for about 5 more minutes. If you want to use a dough hook in a stand mixer, you may, but I recommend just using your hands, so you can get a good feel of the dough. You can use a plastic scraper like the one I mention on the post above, to help you transfer the dough from one place to another. In the final 2 minutes of kneading, add jalapeño pepper and cheddar cheese to dough. At this point, dough should feel wet, but not very sticky. If it’s extremely sticky, you might want to add one or two tablespoons of flour and knead for another couple minutes. Transfer dough to a lightly oiled large bowl. Cover with plastic wrap. Let it rest on top of the counter for about 4 hours, until it’s almost doubled in size. 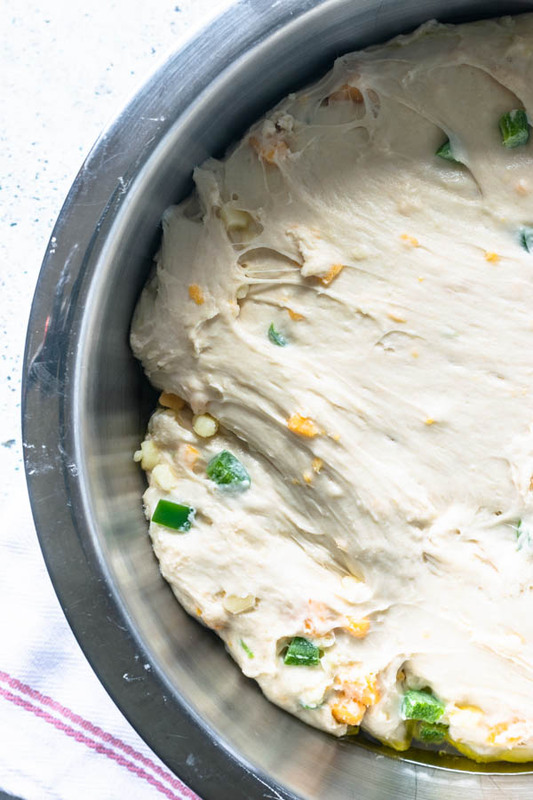 Remove dough from the bowl and divide it into two equal parts (or more if you want to make rolls). Shape each half into whatever shape you are going for. If you are going for a boule (the round loaf) simply grab both of your hands and place them on top of your loaf, then, proceed to apply minimal pressure at the same time as you bring some of the dough to each side and tuck them under the dough, trying to make a ball shape. Do this a couple times, as you rotate the dough. If you are going for a batard, or a baguette shape, simply make a rectangle with your dough, then bring each end from the longest side together in the middle. Tuck ends under to taper the torpedo, or baguette shape you are intending to make. Place both pieces of dough in bannetons, or proofing bowls, that have been dusted with flour. Or you can even let the dough rise free standing in a baking sheet, just make sure to dust the baking sheet with semolina or cornmeal, since you’ll probably just bake the dough in that same baking sheet. Remember to place each dough in one baking sheet, because they will rise and expand. Cover dough with plastic wrap. Refrigerate overnight. The next day, when you’re ready to bake, remove dough from refrigerator an hour before you start to bake it. If I am baking a boule shaped dough, I like to bake it in a cast iron or dutch oven with a lid. Place your bread in there and cover it with a tight lid. Once the bread starts to bake at a high temperature in the closed pan, it will create a lot of steam inside that will help the bread develop a beautiful crust. If you don’t have one of those, fret not. Simply bake your loaf in a baking sheet. You may place a cake pan inside your oven to create a steamer, and pour some hot water in this pan when you place your loaves in the oven. Don’t forget to score your bread before baking it. As soon as you put the loaf in the oven, turn the temperature down to 450F. If you have a steam pan inside the oven to help you create steam, pour some hot water in it as soon as you place the bread in the oven. For free standing baking: Bake it for 10 minutes. Rotate pan. Bake for another 10-20 minutes. For cast iron baking: Bake for 20 minutes with cast iron lid on. Remove lid and bake for another 10-20 minutes. Bread’s internal temperature should read about 200F. They should look golden brown on the outside and sound hollow if you tap their bottoms. Let bread cool before slicing it. 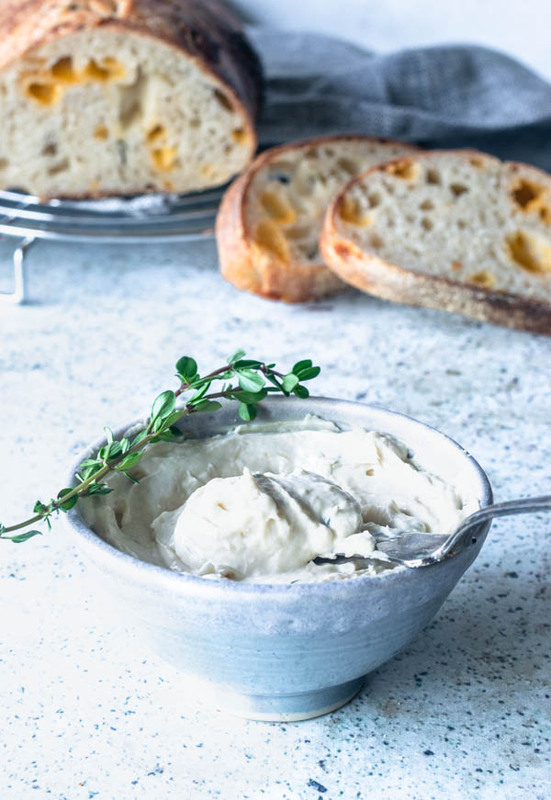 This Roasted Garlic Spread will go great with any bread, toast, or cracker. It's rich, garlicky and creamy! Grab a whole garlic head. Slice the top of the garlic head with a sharp knife. Place garlic head on top of a aluminum foil rectangle. Drizzle about 2 teaspoons of olive oil over garlic head and sprinkle with a pinch of salt. Now, wrap the foil around the garlic head. Place it in the oven for around 45 minutes. Remove from the oven and let it cool before opening it. Open foil and squeeze garlic out of the head into a bowl of a stand mixer. Add cream cheese. Cream for about 2 minutes on medium speed. Add salt, pepper, thyme and lemon juice. Cream for a few seconds to combine. Serve with bread. Store in refrigerator for up to 3 days. putz, somente 8.000 km me separam dessa delícia!!!! I love any kind of cheese bread and adding jalapeños just sounds like an absolute dream. you had me at bread+jalapenos! This looks so yummy! I want to reach through the screen! Ugh, math!! 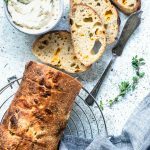 Jalapeno bread IS my favorite so even though it seems kind of tricky and time-consuming, I am adding this to my must-make list. Jalapeno, cheddar, garlic….yum! Definitely not your standard bread recipe, which I love! 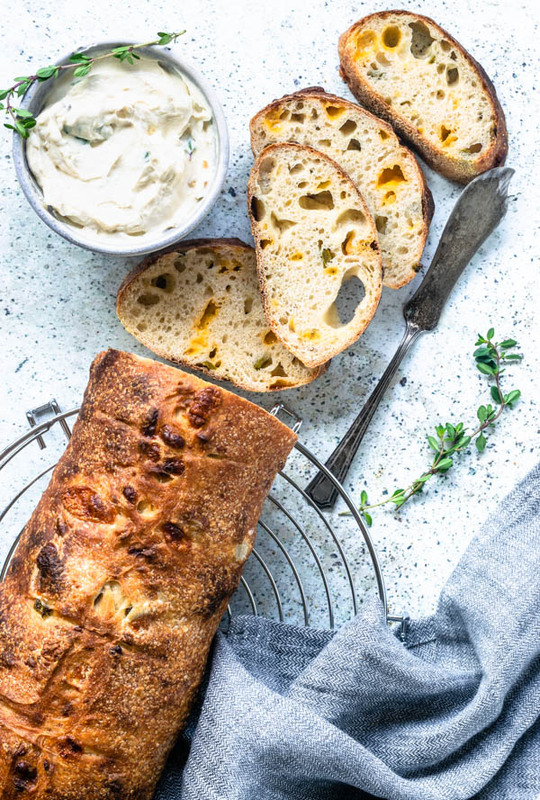 This bread looks delicious. . ah, I love a good savory bread. . Cheddar Jalapeno Sourdough Bread sounds fabulous!!! Homemade sourdough bread is the best! I love these mix-ins. So flavorful!! Thank you! I agree homemade sourdough is the best! This sounds like my dream, I could literally eat this all day long! omg thats what I did, Amy lol!!! This looks amazing! Thank you for such a detailed post. Baking GREAT sourdough can be so intimidating. Omg 😲 such a brilliant post and such yumm flavors! I am a huge sourdough bread fan and adding jalapeño and cheddar to it is like a cherry on the top. I am glad to have people like you figure this stuff out, LOL I love making bread but I haven’t tried sourdough. All the percentages and ratios would personally take the fun out of it for me. There was a reason I was an English major 🙂 But the bread and spread both look delicious and you figured out all the hard stuff for us! WOW this bread looks so crunchy and delicious! Perfect for hosting! 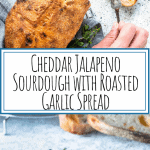 I love the combination of cheddar cheese and jalapeno!